My First Art/Craft Show (That I'm Planning)! Ok, so I know I've been MIA for awhile now, but I've had something big in the works. No...seriously...huge! At least to me. This has been a tough secret to keep from you, but I didn't want to say anything lest I jinx myself. Anywho, everything's public now so it's safe to share the news with you! I'm planning my first craft show! Yes! I mean, I've been in many craft shows to sell my jewelry...well, if you count all the craft shows my dad took me to when I was a kid, then I guess I've been to craft shows all my life, but details...details. Ok, so for the show details...I've been wanting to do a craft show in the Charlotte, NC area for awhile now, but I wanted to find a good charity to work with so the event would benefit a good cause...win-win, you know? I'm super-excited to tell you that I've teamed up with the Charlotte Avon Walk for Breast Cancer to plan a craft show to benefit the walk...how cool is that? It's called Pink at the Plaza and it will be Saturday, May 17th from 10am - 3pm in Charlotte, NC near the beautiful SouthPark and Cotswald areas of town. It's going to be an awesome outdoor show and so much fun! Anywho, I've spent many, many, many hours over the last couple weeks creating the web site (http://www.pinkattheplaza.com) for the event, as well as creating the Vendor Application and working on other details. The set-up work is done, so now I just need to get the word out. 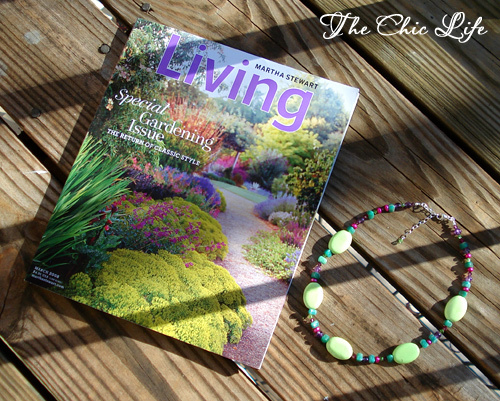 I just loved the bright greens paired with the deep pinks and purples - so pretty! Can you imagine having a garden like that? 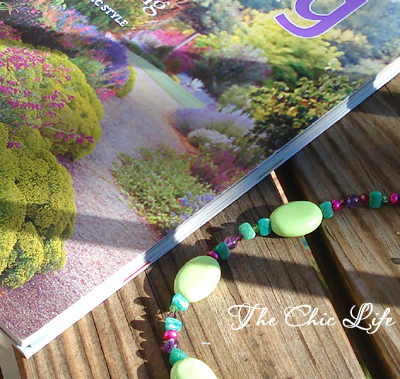 The necklace features chalk turquoise, Russian amazonite, and Peridot-colored Swarovski crystals, which remind me of the greens - both light and dark - in the photo. I also added some amethyst, freshwater pearls, Swarovski crystals in Fushia and Amethyst to represent the purple and deep pink blooms peeking from the greens. The necklace includes sterling silver components and is a steal at only $45 for all those amazing materials in one beautiful, garden-inspired design. 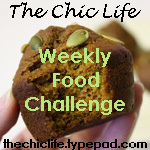 Email me at thechiclife at gmail dot com if you're interested. Wow - things have been so crazy. As much as I'm looking forward to my wedding and honeymoon, I can't wait for it to be over so I can have some free time again! 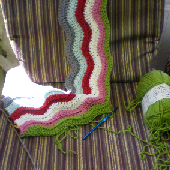 There are so many things to do, it seems, that all I have time for craft-wise is to gaze longingly at my growing fabric stash and other craft goodies without any real time to do anything with them. Maybe I'll be able to squeeze some time in this week? I hope so. 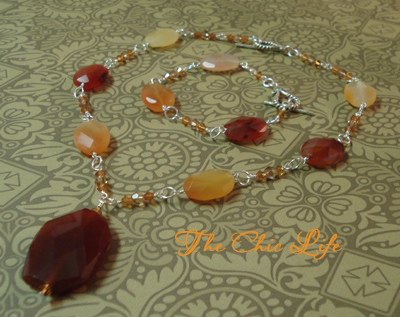 Recently, one of my fave clients asked me about a set I had already sold on my web site called, Tahitian Glow (click here to see the original necklace & bracelet). 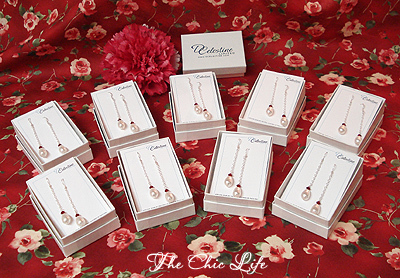 She ordered the earrings earlier but was interested in getting the matching necklace and bracelet, which are marked as "sold" on my web site. Happily, I told her that they were only sold b/c I didn't have the pendant I needed for the necklace, and I wasn't sure if I had the clasp for both, but that I could look into finding some of the necessary components. Turns out, I had the clasps in my jewelry goodie box and I was able to get a great faceted, red carnelian pendant at a local bead store. It's not the same as the pendant on the original, but it is the same gemstone and I think, an even better fit with the other beads in the necklace! 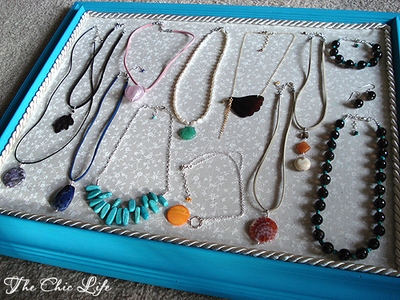 I gathered all the materials on my "bead board" (aka the top to a plastic bin) and got started. See that spool of wire to the back right? I cut small pieces off of that and use my jewelry tools to wrap the wire to form hoops and what not, connecting all the beads together bit by bit. 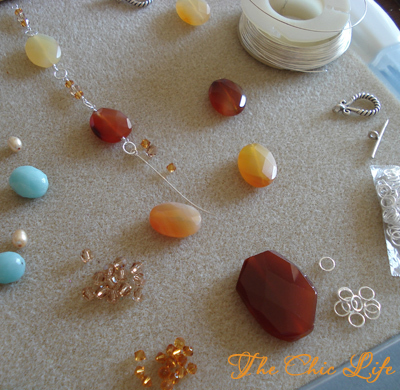 See there in the top left - I've started connecting some of the Swarovski crystals to some of the gemstones. Here's the finished product - the necklace and the bracelet. Not too shabby, eh? 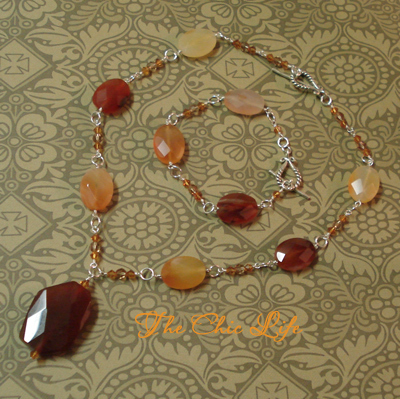 I love the warmth of these red carnelian gemstones and how the Swarovski crystals add a touch of bling to the look. The sparkles get me every time. Here's another view. I hope she likes it! When I first started making jewelry, I used to make these cool bracelets called "Mother's Bracelets." Have you heard of them? They're quite brilliant, actually. No, I didn't make them up (I think the concept has been around for awhile), but I made my own Mother's Bracelet designs. :) Anywho, the basic concept is that you get silver sterling cube letters in the name of your child and then put various sterling beads with colored beads in the child's birthstone color around the letters. 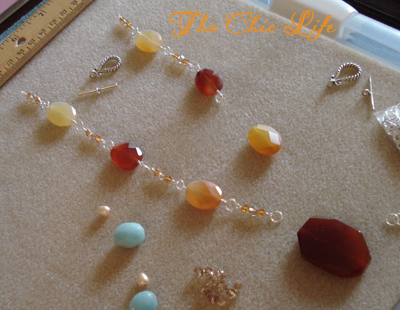 People often will add more than one strand to their bracelet - one per child. The biggest I've made was a four strand for a mom with four kids - it was quite pretty. These style bracelets make great gifts and are really just so sweet. Who wouldn't want one? I mean, I wouldn't, but that's because I don't have kids. 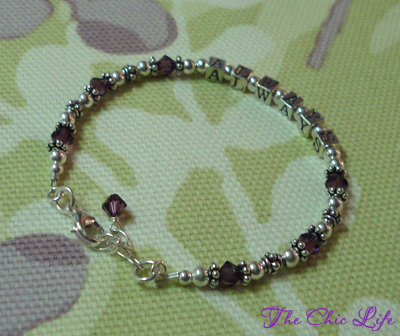 Instead, I made a Mother's Bracelet style bracelet but with my name and my birthstone crystals. Over time I phased out the Mother's Bracelets, but recently, I've started thinking of bringing them back. They will be a pain to add to my web site, but they are really feel good things to make - the moms who get these LOVE them. I made one of these Mother's Bracelet style bracelets recently for a good friend's little sister's birthday (that was long). He was so impressed with it that he asked me to make one for his girlfriend for Valentine's. He said she wouldn't like her own name in the bracelet, but he came up with the idea of putting "ALWAYS" in the bracelet instead. How sweet? We used purple crystals for the accent color because purple is her favorite color. This is a design board I work on from time to time. 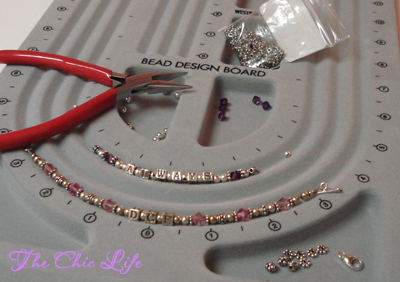 I usually use it when I'm trying to lay out a specific design, and a Mother's Bracelet is a very specific design. I like to either have a photo of the bracelet design I'm using or the actual design in front of me so I get the pattern right. I guess that doesn't make much sense unless you saw my other designs, but basically, I created roughly five designs and each had the same pattern except I'd switch out the letters and the crystal colors. I think the finished product came out pretty nice, eh? Hopefully, I get feedback tomorrow. Hey, Mother's Day is coming up soon so if you want one, send this blog post to your SO and drop a hint. I don't have these on my web site, but I'd be happy to work through the order via email (thechiclife at gmail dot com). They're pretty straightforward and simple and best of all for the guys - no shopping required! At least they wouldn't have to leave the comfort of their home! My friend said the earrings were for her cousin and that they liked my Megan in White and Blue, which were the same earrings I made for my other good friend's beach wedding (except the beach bridesmaid earrings were in white and aqua instead of white and blue). I think the Megan earrings are really one of the best bridesmaid earrings because the design is simple - it adds to the beauty of the bridesmaid dress, without being too over-the-top. It helps that I can easily switch out the crystal to match almost any bridesmaid dress color and that they're quite affordable. 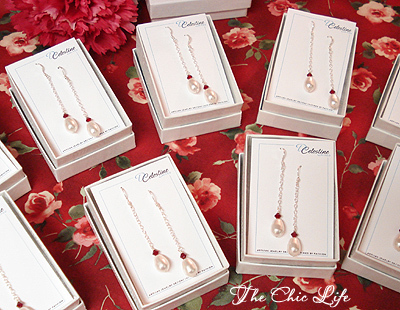 This new order was for the Megan style of earrings except instead of blue, they wanted a deep, rich red color (they called "Claret"). Thank goodness I use Swarovski crystals because they make crystals in nearly every color imagineable - they don't just make red, they make about 5 kinds of red! 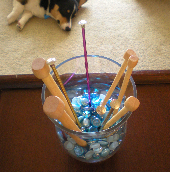 After visiting a local bead store to pick up the correct crystal color, I gathered my supplies on my work area (aka my coffee table). I use this neutral-toned bead pad to keep my beads from rolling around and I keep the bead pad on top of the plastic lid of a bin I have containing all my main bead supplies. I use the lid like a tray so I can carry my project around if need be. 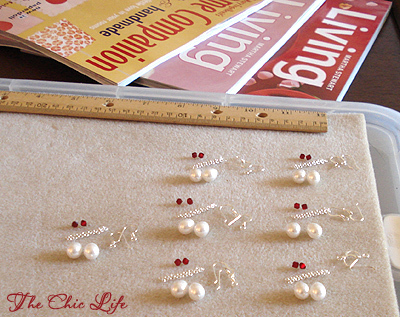 Bit by bit, I made each pair of earrings - nine total. 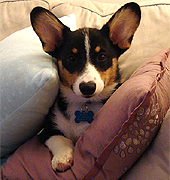 Bailey was very curious about what I was doing. 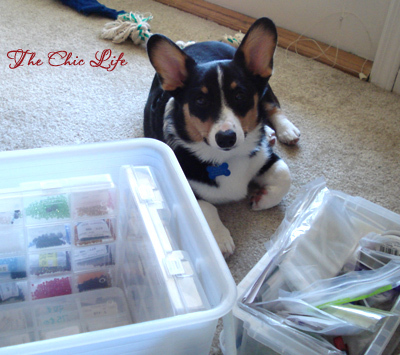 He sat just behind my bins of beads and other supplies. 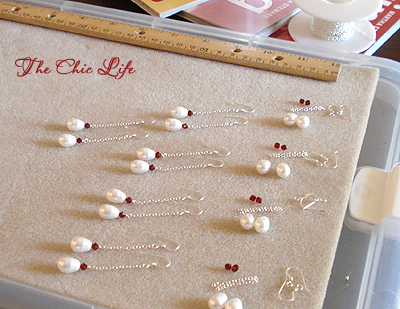 After the earrings were done, it was time to package them for shipment. Aren't they pretty? I normally do my packaging in my "official business color" - turquoise, but today I wanted to match the bridesmaid earrings (well, ok, my packaging is a bit brighter than "claret", but it's closer than turquoise!). Anywho, I shipped the package today, so let's hope they love them! Alrighty then - who else needs bridesmaid or wedding jewelry? This is fun! Not sure if I've mentioned it before, but I'm getting married in May...yea, May of this year. I'm so behind on entirely too many things...I haven't ordered stationery, and I haven't even gone wedding dress shopping...not once! I know. I'm crazy. I'm just not a big "wedding person." I've only ever been to about five weddings in my life...EVER. I'm basically clueless when it comes to weddings. I'm also broke. 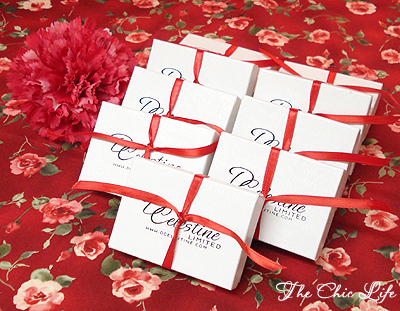 When I started D Celestine about three years ago, I did something smart and kept my business and personal finances separate. The really stupid thing I did was run up my biz credit card when I was taking losses instead of using my personal money to keep myself from going into debt. Now that the bill has reached an intolerable amount, I'm realizing that I'm going to have...absolutely HAVE to use my personal money to pay the stupid thing off (stupid credit card!). How smart am I trying to pay off a credit card in the same year I'm getting married...oh, and did I mention that we're house hunting? Yea...not the smartest gameplan ever designed, but what are you going to do? I'm trying to be more responsible about everything. I've been working on getting my personal and business finances in check. I've been tracking every dollar I spend in an Excel file. I've cut my expenses as much as possible. I try to only buy supplies when I need them, not so much when I want them. But, beyond that, I've been racking my brain trying to figure out how I can make more money to pay for everything. The only solution I can come up with is making stuff. Making more jewelry, working harder on marketing the jewelry, and even possibly making some other crafty goodness to sell on Etsy is on my list of things to do...along with "finish planning the wedding". I dunno...those of you out there who make and sell stuff know it's so very hard to do business online. There's so much competition. It's not a "if you make it they will buy it" world. Anywho, all these finance-related thoughts had me on a beading frenzy this weekend. The side table next to my couch has been covered with random bags of beads for the last few months-ish. There are piles and piles of beads everywhere. I'd take a picture, but I'm embarrassed to show it. It's such a wreck. I had so many good ideas for designs, but not the time to make them, so my designs and my supplies just piled up and up. I didn't want to put them up because I knew I'd probably want to use them the day after putting them up. I tried to dig through everything this weekend and turn the designs in my head into real designs to sell, but I only got a few things made. I made a cool beaded necklace with large, faceted smokey quartz rounds paired with tiny turquoise beads. I made a few necklaces on suede with giant gemstone pendants - a great buy b/c I can price them affordably but people still get the nifty gemstones. I made a turquoise and chain necklace with chunky turquoise beads - fun stuff. My favorite is the one with the gold chain and etched shell pendant that looks like a wing with a gold pendant and gold chain dangle - I love the asymmetrical designs the best. There's also a simple pearl necklace with a green shell gemstone pendant. I guess I made a lot of stuff overall, but now I have more work to do. Unfortunately, I still have to photograph them, edit them in Photoshop, name them, price them, give them descriptions and upload them to my web site. Phew! This is going to be a busy week. I hope I have time for some Valentine's Day crafting!